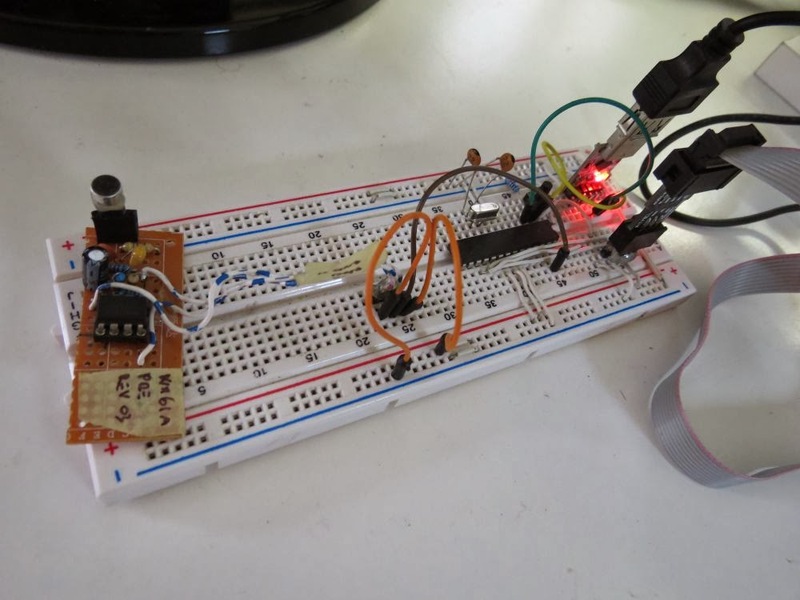 What is proposed here is a SPL db meter using and AVR Atmega micro. A sound level meter or sound meter is an instrument which measures sound pressure level. Sound pressure level (SPL) or sound level is a logarithmic measure of the effective sound pressure of a sound relative to a reference value. It is measured in decibels (dB) above a standard reference level. The commonly used reference sound pressure in air is = 20 µPa (rms) which is usually considered the threshold of human hearing. Keep in mind that 1 pascal will equal an SPL of 94 dB. Because the frequency response of human hearing changes with amplitude, a weighting have been established for measuring sound pressure. Usually the A-weighting curve is used. 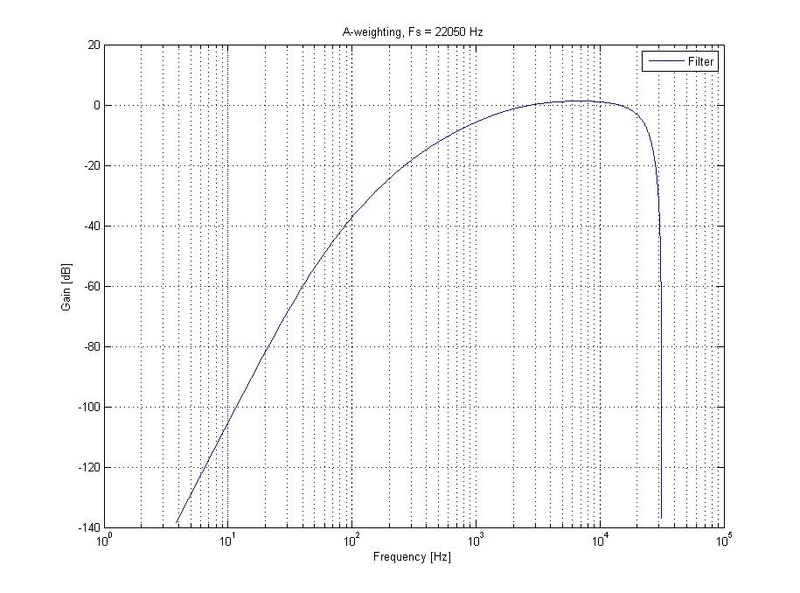 A weighting curve is a graph of gain across the frequency range (10Hz to 20kHz). given p_rms as the sound pressure measured, and p_ref as the reference sound pressure. given refRMS as the reference RMS value for the input board at a know refSPLdb SPLdb level. Every sample is collected at a fixed time, a timer interrupt impose this timing, this is because we need to know the sampler frequency, to built filters and output signal magnitude. Runnig @16Mhz i'm able to collect samples at almost 22050Hz. 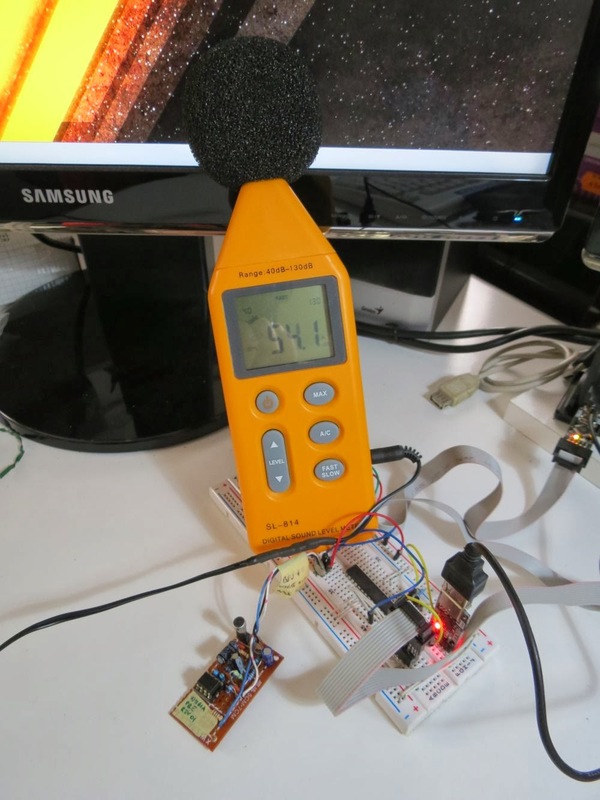 For FFT i've used Radix-4 FFT library you can find it here http://davidegironi.blogspot.it/2013/06/avr-atmega-audio-input-rma-using-fft.html. The method to weighting the signal proposed here just use a weight table that contains the weight of the signal in the frequency domain, this table shoud be FFT size/2, because we can retain frequencies below Nyquist rate. A matlab script to check this filter method is used. 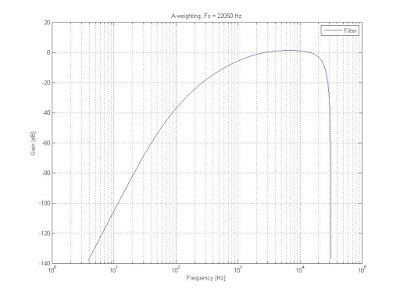 The picture above is the frequency reponse graph of the A-Weighting curve used. 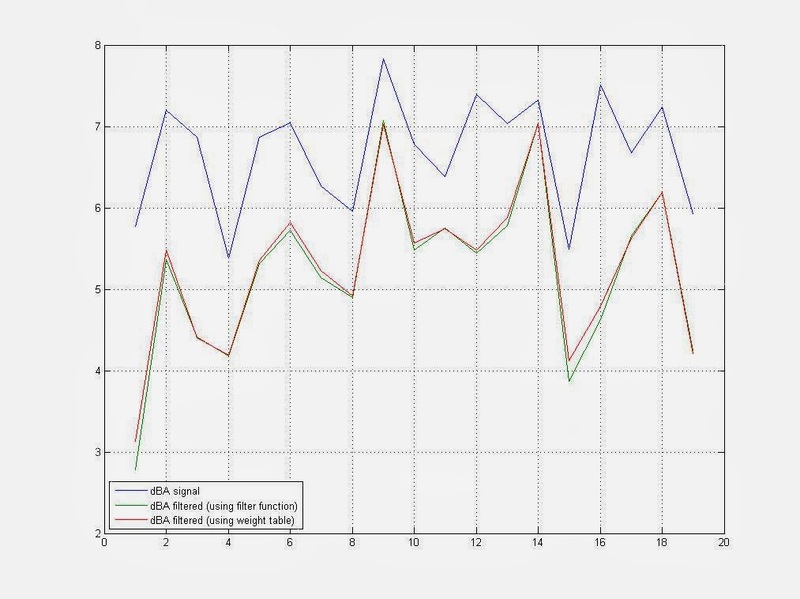 The picture below compares the values of SPL for the unfiltered signal (blue), A-weighting filtered signal using the matlab "filter" function (green), A-weighting filtered signal using the weight table method (red). As you can see, matlab native "filter" function and weight table method almost response in the same way. Once we have got the A-weighted signal we can compute the RMS value for the signal. An SPL meter also needs the signal to be time-weighted. Time-weightings have been internationally standardised, 'S' (1 s) originally called Slow, 'F' (125 ms originally called Fast and 'I' (35 ms) originally called Impulse. Y is the RMS signal global, and Ynew is the RMS signal computed every step. alpha effects the filter speed, it has to be a number between 1 and 0. The input microphone preamp board proposed here is a derivation of the John Conover WM-61A preamp. The reference is the schematic-6 found here: Using the Panasonic WM61A as a Measurement Microphone (John Conover). This board is stated 306uV RMS at ~32db. Using an ebay SPL meter, and a scope, i've found that my board implementation should be 315uV at ~32db (which is next to 306uV as stated in the referecence audio board schematics). Two http://processing.org/ scripts are provided as a viewer for the data. 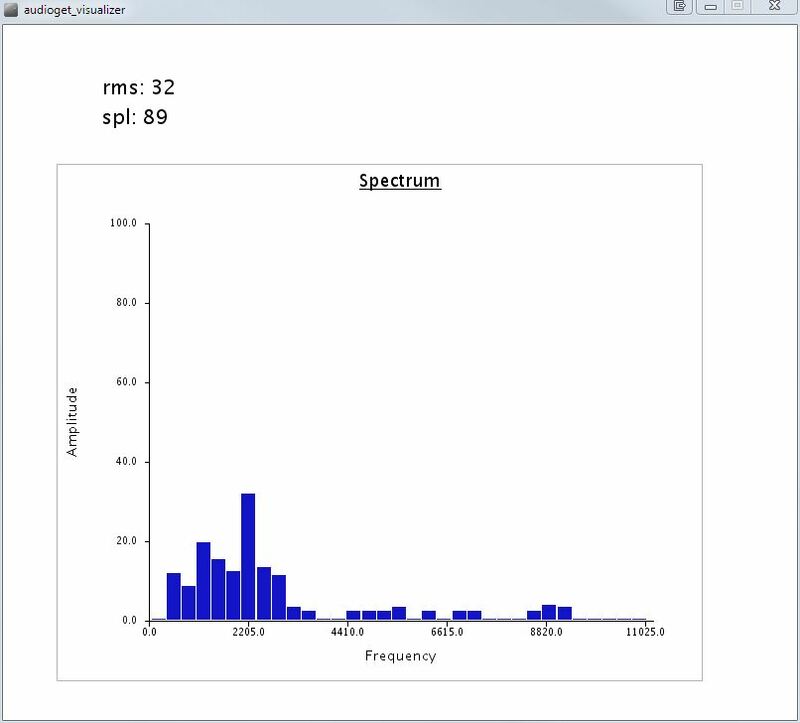 The screenshot below shows one of them, it also show you the spectrum of the input signal. 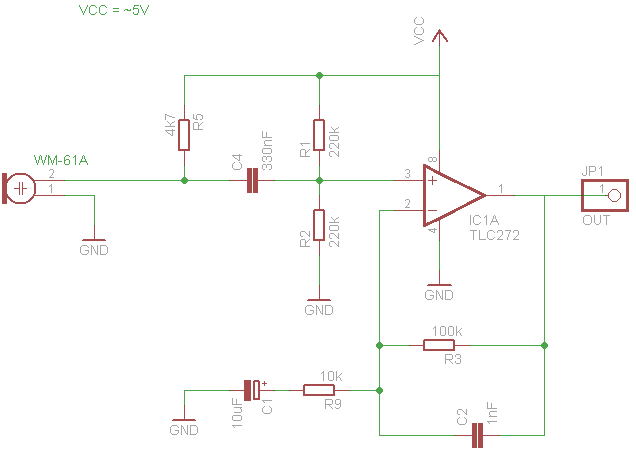 I'm not a DSP expert, so method proposed here can be improved, for example it is possible to implement the A-weighting filter in time domain, becuse it can be used as a IIR filter, this will prevent the use of the FFT computation for the signal, saving microcontroller resources. 02: weighting function bug fix, weighting now applied on both the real and imaginary part of the fft (thanks to Xiaofeng for reporting this bug).